We all know the classroom can be a place some students dread. Why? I have asked students and always get the same answer: "It's sooooooo boring!" How do we change their mindset that learning is boring? We make learning an experience. Something students truly look forward to and it starts with us! After having many different students over the years I have worked on creating lessons that are challenging, but creative and engaging. I want students to see learning as an experience, a journey that can be frustrating, challenging, fun, and exciting. I realized quickly with 5th graders it's all about how you sell it. Have you ever been a party with a DJ? If you have you know that the DJ makes the party great. They are the ones who decide which songs to play and hypes up the crowd making them excited to be there and dance the night away. You have to be that DJ. That hype-woman(man) that makes your classroom the place to be. We have to know which assignments to give and when. We also have to make those assignments applicable or exciting to the students to have them tune in. There are some simple and more elaborate things I use to engage my students. I like to change it up because just like a DJ, you can't play the same song 3 times in a row. The crowd or in this case the students are going to get bored of it. Here are a few ideas that you can use to hype up any lesson to get students excited about what they are learning. Recently I have started to add drums to my math lessons. I had the idea from something I saw when I went to the Ron Clark Academy (RCA) a few years ago. While I was there I observed the use of drums in classrooms to keep students on track. They would choose students, especially those who needed help focusing and give them the honor of using the drums during class. They would play them when students gave correct answers, gave good points, or in celebratory moments. I thought it was cool at the time, but I didn't know when or how to use it in my own classroom. I went to Marshalls several months later and came upon a drum that I just had to buy for my room. I realized if I was going to ever use it I might need more than one drum...so what did I do? I bought 20, just kidding. I ended up asking my community for empty oatmeal containers. I covered them with fun painted paper and they became my "drums". I never really took them out until one math lesson. We were working on multi-step fraction problems and I could tell I was losing student interest. Inspired by RCA, I took out my original drum and hit it every time my students chimed in with the next correct step. The students woke up and wanted to participate. After one problem, I started a band and they have been excited ever since. I have never been a cheerleader, but I love music and dance. I try to include both in my classroom the best I can. Over the past few years, I have personally developed some cheers to promote learning in my class and create a team atmosphere. If you love music or are just a spirited cheerleader in your own right consider creating some cheers. Cheers to help your students or have them make some on their own. I have had students create group cheers, class cheers, and even academic cheers using important vocabulary or concepts to help them remember crucial information. Anytime you make learning real to students and take them somewhere it can truly excite and connect students with the material. I grew up in the Chicago Suburbs so I had the privilege of attending all the Chicago area museums and zoos to really connect to the material. When I moved to a rural area I realized quickly that these experiences would be a little more challenging to obtain but not impossible. I get to take my students yearly to Heritage Days, a historical based weekend event that happens in our time. This event has many artisans and replicates a rendezvous of traders from a period of time. These traders represent various time periods that are taught in our 5th grade curriculum. It is an experience that student can't get in a classroom. They step back in time and we reflect it on it all year. I have seen teachers take their students to the courthouse for fairy tale trials, to a nearby college to learn about a particular subject or work with amazing tools. A teacher could take to a local store or a mall to practice math skills. The possibilities are endless! You can make learning tangible, but also make those community connections. Now with digital media expanding places are closer than ever. They are only a phone/tablet/computer away. I have used Virtual Reality apps to take my students places and give them experiences I physically can't. This year alone I used the NBC app to allow my students to experience what it is like to ski during the Winter Olympics. All this took was my iPhone and a $10 VR Headset from Walmart. Students love experiences and putting them in a role. By giving them a job they will definitely play the part and the learning will become important to their reality. I try to make the material we are learning applicable to the lives of my students. That is why during our ancient Greek lessons I "take my students to a Greek restaurant." I flip my room into a restaurant! Complete with tablecloths, menus, music and I play the waiter. They are given the job of spending so much money and making sure everyone in their family gets something to eat. My students practice adding and subtracting decimals while putting them in a scenario that many of them have been a part of before. We practice figuring out the tip and writing checks as well. I have also put my students in the role of an editor and chief of a magazine where they have to make corrections to articles. Students have also been detectives looking for the stolen Constitution or trying to track down Carmen Sandiego and the Main-I-Deer Statue. We have even been crazy bakers who have to figure out the Author's Purpose and double recipes for catering requests. I am constantly trying to find ways to integrate real-world jobs or applications in our curriculum. If students have a goal or feel as though they have a job during a lesson they are more invested and excited to play their part. The same goes for readers theater and literature circles. When given a role of value many students will rise to the occasion. Along with making real-world experiences for my students, I have been using technology in my class to connect them with the world. 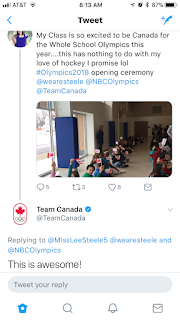 When we are researching people, learning about an event, or just excited to share certain skills, I have my students tweet different people, groups, or companies and see if we get a response. 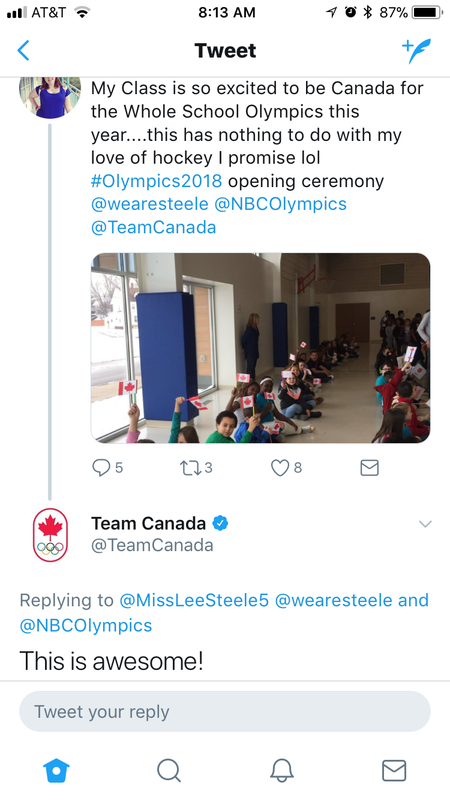 It was amazing to get responses from Team Canada during our whole school Olympics and to hear from Mr.Owl during our science lab. It is not guaranteed, but it can be a great way for your students to get excited about a lesson. You can also partner with another classroom and share what you are learning or discuss via twitter or Flipgrid. I have seen classroom connections with other classrooms and connections with experts on Skype (something I am still working on). If your school has access to technology why not use it to connect your students with the world around them. Connect them to what they are learning or pose a question to the world and see what they get in return. It's a great way to have students get excited about what their learning and share it with others. Technology isn't the only way to connect students with the world, consider connecting with local experts, classrooms, or businesses. This helps not only the community but allows students to feel more connected to what is local to them. With all of these ideas, the main thing to take away is to be excited! As the teacher, it is all about how you sell it. If you apologize and say it is going to be a boring day today they will never buy into it. Instead, you have to believe in your lessons, if you don't love the lesson consider adding something to it to make it something you are proud of. Smile and be excited! If you are excited and play your role the students will get into it and be excited to learn. It starts with us! We have to believe in the magic and make our lessons joyful for our students to get excited about learning. Bring your all and hype up the crowd. I promise you will grab their attention. How do you hype up your students? How do you engage them in your lessons? Have you used some of the techniques I listed or do you have some different ones? I remember my first year teaching 5th grade feeling completely lost. It was scary moving from 3rd to 5th grade. I did not what I was teaching or even how to deal with 5th-grade students. I was making it up as I went. I recall looking through the material and wondering how am I gonna get through all of this, keep my class together, help the students who are struggling, push the students who need the challenge, make everyone happy, and keep myself from losing it. Some people say teaching is an art. Other people think it is one of the easiest professions know to man. "You're a teacher? That must be nice. Summers off and all you have to do is read out of books to kids." I wish people could truly understand the struggle that teachers face daily. I remember my first year correlating it to being a plate spinner. The goal is to spin each plate and keep them spinning so that none of them fall. You are always on your toes and constantly looking for the plate that might fall so you can prevent it from doing just that. It's exhausting mentally, physically, and at times emotionally because when that plate falls we take it to heart. A teacher's job is this and so much more because our plates have names, faces, backgrounds, and dreams. We have to keep everything in our classroom moving in a rhythm that is beneficial for our students and for the expectations set upon us. If you ask a teacher what our true job, many would say to teach our kids. Notice how I stated that "teach OUR KIDS." Yes, standards are important and I do believe that students need to know or at least be exposed to some things before they progress to the next grade. However, I'm not just teaching subjects. I am teaching the whole student. I am teaching a student that they can do things and be successful or that it is ok to make mistakes. I am allowing students the chance to share whats on their mind and leading discussions on how to deal with friendship drama. I am going to student games and events to show that I care about who they are and their true interests inside and outside of the classroom. I always say to my students it's about trying your hardest, making mistakes, and learning from them. You won't get things right 100% of the time but it's important to grow, learn, and be better than when you first arrived. That is what teachers take pride in. The moment at the end of the year when your exhausted from spinning all the plates and you look at your class and reflect on how much they have grown. At that moment it is all worth it. I say all this for all the teachers reading this.... you are not alone. It is okay to feel exhausted and drained. You are human, we all are. Sometimes it feels like our job is never ending like we are Stretch Armstrong being pulled in so many different directions. It is okay to breathe and takes those moments for yourself and for your students. Go out and do a lesson outside for no other reason than it is nice out. It is okay to spend a little time playing a game with your students if for no other reason then to bring a little laughter to their day. I get it trust me I do. I know how much time we put into our lesson plans, how much effort we put forth to teach students. We also know our students. We know when they need a break or they need a smile. Our students are dealing with so much and are aware of everything in their bubble. They might forget that lesson on adding fractions (we hope not), but they won't forget that time you took a moment to talk to them about their parents' divorce or any other issue that they may have. 1. It's ok to say NO! Don't feel like you have to take everything on. For the first few years, I felt like if I wanted people to take me seriously and know who I am I had to volunteer for everything. Volunteer for every after-school activity, event, and be apart of every decision-making group. I never felt like I could say no especially if I felt I was letting down my students. It took a few years of being exhausted and an amazing classroom aide looking at me and telling me "Say No!" I got the message. It is okay to say no. I can't do this event or I'm unavailable at that time. I still love taking on tasks and events for students, but I realized for my own health I can't do it all. Everyone has to pitch in to make the school work and it is not up to just one person. It's okay to do this and not feel bad about it especially if your health is involved. When your exhausted its ok to nap too! 2. Don't be afraid to have fun. Fun seems like such a crazy concept to me now after 5 years of teaching. I got into this profession to help students learn and make a difference. I wanted students to enjoy learning as much as I did and find their voice. Yet after being in the field, I have seen teachers lose sight of the fun. I can't blame those who have lost that light and passion. I had some doubts this past year. Our jobs have become overwhelming with standards (though important are mounding), expectations (often unrealistic it feels), and immense pressure to complete everything in one school year. That along with growing class sizes and dwindling budgets it can be tough to enjoy moments with your class. However, we must. You must enjoy what you do. Do things you enjoy! That is what keeps you from burning out, but more importantly, that is when students learn the most. If you are enjoying yourself and excited about the material then your students will too. I remember being overwhelmed with everything my first year of teaching 5th grade. There were so many standards and content I didn't know yet as a 2nd-year teacher. Frustration and fear at an all-time high I decided to teach something I enjoy, Greek Mythology, and connect it to the standards. It was the best decision I ever made! I got to do something I loved and inspire my students to love it too. Every year I add to that lesson and make it bigger, better, and more fun! Don't be afraid to be different. Try a new lesson! Get messy! Wear a costume and decorate your classroom! Try a new tech tool! Go out on a limb and try something new! I know that change can be hard. One thing is true, change teaches you something. It forces us to evolve and grow and what better way to teach our students this than to model it for them. Thinking outside the box is both challenging and worth it. When we choose to try something new or push ourselves outside the norm we are evolving as teachers. As students change we have to keep up. We have to find something we want to learn, be good at or try. Things are constantly changing in our field and we have to be open to it. Creativity and development is key. The more we push ourselves the better our lessons and ultimately our students will be. Reflecting on my classroom I will always remember looking at those around me during my earlier years of teaching. No one was doing what I wanted to do. I felt like I had to fit the mold and I shouldn't shake things up. After meeting teachers similar teachers with the same outlook as me and attending RCA (Ron Clark Academy) I felt more confident in my "unorthodox methods." I felt a freedom to be creative and try some different things such as a math labyrinth, transforming my classroom into a crazy bakery, or even taking my students on a quest to find Carmen Sandiego. I felt pride in my teaching. Also, my students gained so much from these experiences and loved going along for the ride. 4....but also don't be afraid to keep it simple. With all that being said, don't overdo it. It is important to change, innovate, and be creative but you can only do so much. In the words of an amazing friend, "Pick one thing!" Choose one thing you want to do or try and do it. Don't feel like you have to do it all or be pressured to do it all. There are so many different education tools, techniques, and programs it is ok to try just one. Find something you want to grow in and do something about it. Find something that might help you grow. If it works for you use it, try it some more in some different lessons. If it doesn't try something else. Also, don't feel like you have to reinvent the wheel. We have lives and it is okay to not want to spend an entire day at school. Look for a variety of materials, use things you already have, or borrow from those around you. I constantly use books and Teachers Pay Teachers resources to make the lesson I intend to teach. I look at my lessons as "semi-homemade". I can't see doing it any other way. I make those lessons my own and tweak them to fit my lesson, my students, and my teaching style. I choose what would be best for my students and supplement as needed. We have to prioritize our time so it is okay to keep it simple. 5. Be yourself and reflect on your why. You have to be the teacher you wanted to be when you started. These years go by and we forget why we are here. It makes sense. I stated earlier we have so much going on and so many pressures that we get bogged down. We need to be true to ourselves and remember our why. Why did we get into this profession? Why have we remained? We have to remind ourselves from time to time why we are here. I post pictures of my students around my desk and call it my Hall of Fame. I try to update it when I see students years later. My why is that I want to shape the future.Sometimes, I don't always see that happening in my classroom, but just looking at those photos, renews my enthusiasm. I love seeing my kids grow, and reading their emails reminds me I have made an impact. In the bleakest moments or most frustrating, we have to recall our why and who we are. Not everyone could do what we do day after day. We work with students from all over with a variety of attitudes.bad We try to give them hope. We are teaching the future and trying to help them uncover their potential. It starts with believing in them. Let me know if you have any tips for a plate spinning teacher.